We have to give Nanjing Auto/Shanghai Auto/Ason Unique credit for taking care of their MG brand. MG/Rover has a long history of making awesome police cars back in Britain and the Chinese version of the company has been making vehicles for both the Chinese police and the army. 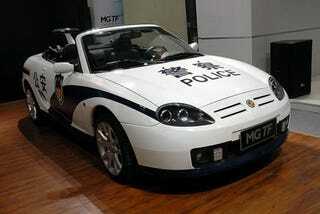 And while we're not big on Chinese authorities, what with the human rights abuses, we have to admit this MG TF convertible police car is quite rad. We especially like the shark fin stalk holding up the cherry.